There are more well-known cities and areas in Argentina than Mendoza. Larger, more exciting locations that offer up typical adventures, adventures a tourist would experience with a passing remembrance. Mendoza is different. It is a place to feel the pulse of true Argentine life, a place for the traveler to relinquish preconceived notions about South American life. Mendoza is a deeper experience. It’s also a fantastic place to revel in some amazing food and wine. Mendoza is located near the northwest border shared with Chile, nestled just below the snow-capped Andes Mountains that make up this border. It is a city of just over 100,000 people; not small, not massive. It is also a place that celebrates the independence of Argentina from the rule of Spain. These two aspects create a perfect environment to witness the heart of Argentina. One reminder of Argentina’s independence lies at the top of Cerro de la Gloria (Glory Hill), a trail leading up into the foothills overshadowed by the mighty Andes. A mere 15-minute walk up, the trail ends with a multi-layered statue of Gen. José de San Martín. This replication of a mountain has a cast of the general on horseback as he leads his people in a revolution. Above the image of the general, sitting atop the pinnacle of the mountain is an army led by an angel of liberty holding broken chains. Cerro de la Gloria also has the best view in the city, where the traveler can catch jaw-dropping views of the city below and the surrounding mountain ranges. Mendoza’s unique elevation lends an exotic taste to its food and beverage creations. 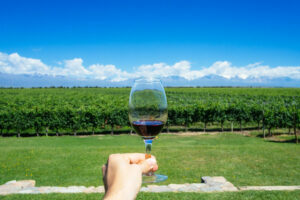 Known as one of the nine Great Wine Capitals in the world, Mendoza is the largest wine-producing area in Latin America. Malbec wine is the real star made from the almost 356,000 acres of vineyards. The elevation of these vineyards average around 3,000 ft. above sea level, which give the grapes more sunlight—while the arid temperatures and mild winters allow these vineyards to thrive. The malbec wines of Mendoza are renowned for their smoky, yet fruity, flavors. These flavors are especially complimentary to Argentine cuisine; usually large portions of grass-fed beef grilled to perfection, filling empanadas, and traditional-style pizzas made from local tomatoes. The tastes of Argentina are as simplistic and full-bodied as the gorgeous landscape that surround them. Argentina is an underrated destination, Mendoza even more so. That’s why CTS Fares wants the travel professionals to know that getting a client to Mendoza is only a click away with their booking engine. With discounts on over 90 major airlines, white label B2B2C options for your website, and the ability to send itineraries to a client—CTS fares makes the travel professionals job easier to amazing places like Mendoza, Argentina.